What is the Weight Range for Adult Norwegian Forest Cats? 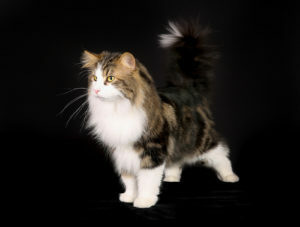 Fully mature adult Norwegian Forest Cats usually weigh between 12 to 16 pounds (males) and 9 to 12 pounds (females). These sturdy cats descended from rugged ancestors on Viking ships are well-muscled, large pets who need a high proportion of protein and fat to stay happy and healthy. If your Wegie is starting to develop a “kitty muffin top”, be prepared to introduce a special diet under the guidance of a Veterinarian. 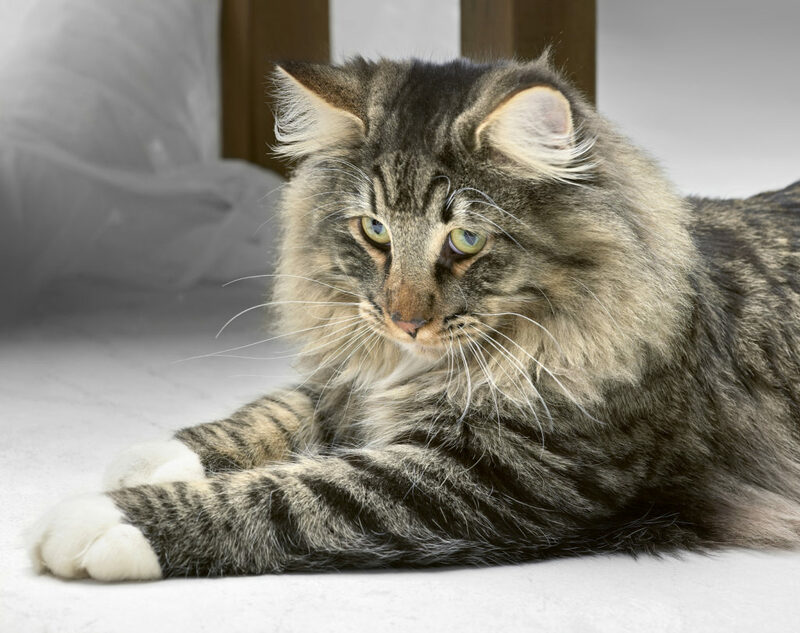 Norwegian Forest Cats can easily overeat and gain extra weight, which can cause possible future health risks. Remember that during a diet you need to aim for slow and consistent weight loss. Improper feeding or rapid dietary changes can result in other equally or worse health issues. If you are unsure about the proper diet for your Wegie, contact your veterinarian or breeder for professional advice. On the other hand, low weight can also be a symptom of an underlying disease or improper feeding. Make sure the food you are putting out has enough protein and fat for your Wegie. If you are sure that the meals are well-balanced and your Wegie is still underweight, make an appointment with your Vet to identify the underlying cause. Because Norwegian Forest Cats are not fully grown until about the age of 5, expect them to continuously gain weight until that age. Even though there are cases where 16+ (males) and 12+ (females) pounds are acceptable weights because of larger overall frames, make sure they are getting the right amount of exercise and the appropriate nutrition to maintain a healthy lifestyle and not continue packing on weight past 5 years old. If you have any questions or concerns, consult a professional veterinarian right away. They can help ensure the proper weight and overall health of your Wegie.